Kaiser Permanente Hawaii recently awarded more than $220,000 in community grant funds to five Hawaii organizations. One of the recipients, Grow Some Good, is a school garden sustainability program on Maui that provides seed funding for schools to establish garden education programs. 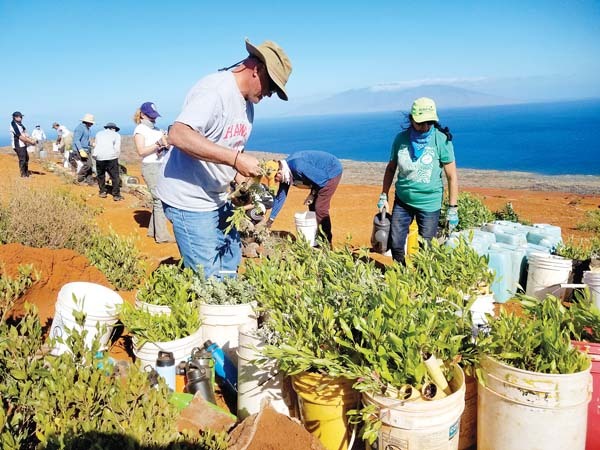 It will receive $9,900 to fund a curriculum for up to 3,500 students in Maui County to learn about aquaponics, Hawaiian botany and nutrition. A portion of the gardens’ harvests will be distributed to low-income communities. Representatives of Kihei Lutheran Church presented a check for $5,000 to the Kihei Youth Center on Sept. 22. The funding was the result of a grant that was awarded to the congregation from the Thrivent Financial Foundation, a private foundation that operates exclusively for charitable, educational and religious purposes. The purpose of the grant was to offer assistance to a community organization that the congregation was already supporting. Kihei Lutheran has been sharing its kokua by helping to supply food for the center, as well as carrying out special projects such as purchasing back-to-school clothes and slippers for many of the center’s keiki. Duke’s Beach House recently presented Hawaii Agricultural Foundation with a donation of $1,968 as part of the Localicious Maui program. The Localicious Maui program supports island agriculture by providing scholarships for students pursuing a degree in agriculture and grants to establish the next generation of farmers, according to an announcement. A portion of the proceeds from the Farm Salad during the months of April, May and June were donated through the Duke’s Beach House Legacy of Aloha Program. Throughout 2014, Duke’s Beach House will donate a portion of the proceeds on a featured salad, made with Maui grown produce, to Localicious Maui. The featured salad will be denoted by the “Growing Future Farmers” logo on the menu. For more information, call 662-2900 or visit www.dukesmaui.com. Hawaii Pacific Solar, a Maui-based solar PV design and installation company, has awarded two education grants totaling $2,718 for solar energy-related projects at Hokulani Elementary School and King William C. Lunalilo Elementary School, both Kaimuki Complex schools on Oahu. Hokulani Elementary School received the entire amount requested, $1,402, to explore the application of PV systems and their use in powering LEGO robotic projects at the school. Teachers Marcus Pottenger, Naomi Oshiro and Laurie Yoshinaga submitted the grant with Hokulani’s principal, Holly Kiyonaga. King William C. Lunalilo Elementary School received $1,317 to participate stateside with the Hokulea and Hikianalia in the first science project on hydroponics. Lunalilo has focused on sustainability for the past three years and was adopted by the Hokulea as it travels on its three-year worldwide voyage. Principal Amy Kantrowitz submitted the proposal. Maui Food Bank received a $10,000 donation from the Harry & Jeanette Weinberg Foundation on Sept. 27. The funds will go toward the Maui Food Bank’s Aloha BackPack Buddies Program, according to an announcement. The Aloha BackPack Buddies program provides six meals for the weekend to children who are on the free or reduced lunch program at their schools. The program provides backpacks full of food to 600 students a week at 15 schools, including four schools on Molokai. For more information, call the Maui Food Bank 243-9500.